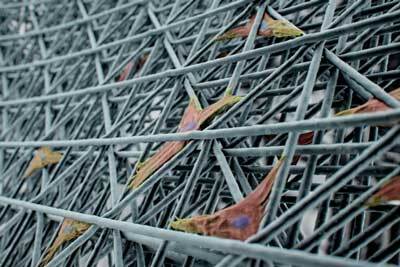 (Nanowerk News) A new way of making scaffolding for biological cultures could make it possible to grow cells that are highly uniform in shape and size, and potentially with certain functions. The new approach uses an extremely fine-scale form of 3-D printing, using an electric field to draw fibers one-tenth the width of a human hair. The system was developed by Filippos Tourlomousis, a postdoc at MIT’s Center for Bits and Atoms, and six others at MIT and the Stevens Institute of Technology in New Jersey. The work is being reported in the journal Microsystems and Nanoengineering ("Machine learning metrology of cell confinement in melt electrowritten three-dimensional biomaterial substrates").